Marshalltown, IA - Ryerson Tull Coil Processing has installed a high-speed precision multi-blanking line with embossing capability at its expanded Marshalltown, IA facility. 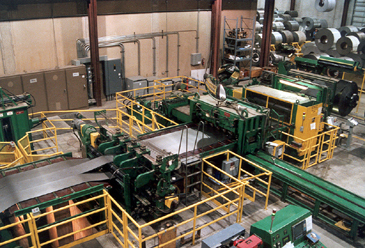 The Multi-Blanking Line, designed and manufactured by Braner/Loopco, Schiller Park, IL, is capable of producing precision tolerance cold rolled, galvanized, and pre-painted embossed steel blanks and sheets ranging in size from 8" wide x 12" long, to 74" wide x 192" long. The line has the ability to process coils weighing up to 50,000#, with a gauge range from .014" through .050". Line operating modes include high-speed sheeting, side trimming, and multi-blanking up to five (5) finished blanks at speeds up to 300 FPM. Embosser: A 250-ton embosser is installed at the entry end of the line to impress a modified stucco pattern into .028" thick x 74" wide strip. The embosser is equipped with 24" diameter engraved work rolls positioned by a pair of adjustable pressure hydraulic cylinders and driven by a variable speed DC drive. The embosser is mounted on a special base that allows it to be "injected" into line when embossed parts are produced. 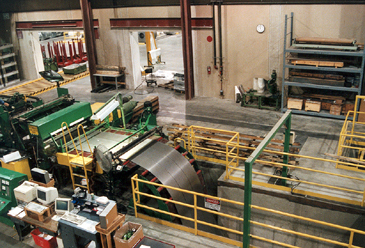 Leveler: The Ryerson Tull Coil Processing line is equipped with a "Cassette" type roller leveler equipped with a 1.500" x 17 roll x 5-hi cassette capable of producing panel flat sheets by removing strip shape defects such as wavy edge and center buckle. The Cassette Leveler is designed to utilize multiple interchangeable work roll "cassettes" for leveling a wide variety of gauges and products. The capacity of a roller leveler is determined by its work roll size and roll centers, and the product that can be processed by a leveler is determined by its back-up roll arrangement. Logically, large diameter work rolls are utilized for leveling heavier gauges while small work rolls are used for leveling lighter gauges. Typically, a given work roll size will correct within a gauge range of approximately 4x. Above and below that gauge range the leveler will have limited ability to completely eliminate strip shape defects. Leveler back-up rolls are arranged in 4, 5, and 6-hi configurations, with each configuration having benefits and drawbacks. A properly sized 4-hi leveler will do a fine leveling job, is the least costly, but "tiger striping" surface sensitive materials can be troublesome. A 5-hi configuration levels as well as a 4-hi and has the benefit of eliminating tiger stripes on the top of the sheet. A 6-hi will eliminate tiger striping on the top and bottom, but cannot shape correct as well as a 4-hi or 5-hi. The "conventional" leveler is equipped with a "fixed" non-changeable work roll size and a fixed back-up roll arrangement. This design limits conventional levelers to a narrow gauge and product range. A Cassette Leveler, by comparison, can be equipped with multiple interchangeable cassettes, each with a different work roll size and back-up arrangement. For example, although the leveler included in the Ryerson Tull multi-blanking line is currently equipped with a 1.500" x 5-hi cassette, the leveler is capable of accommodating future cassettes that range in size from 1.156" to 1.750" in 4, 5, and 6-hi back-up arrangements. Various size cassettes can be added in the future, allowing Ryerson Tull to respond to customer demands and business opportunities as they may arise. The Ryerson Tull Cassette Leveler is equipped with computerized roll positioning controls, a tool that minimizes the black-art of leveler set-up. The gauge and strength of the material is entered via keypad, causing the leveler to automatically adjust to a prescribed entry and exit roll gap. Another command adjusts the leveler for center buckle and wavy edge. Manual overrides allow the operator to make entry and exit roll gap and roll bend adjustments on the fly. Job numbers can be assigned to final leveler set-up parameters for future recall from the computer memory the next time that particular job is processed, minimizing leveler set-up and adjustment time as well as minimizing scrap.